Peace and security funders are making important contributions to global peace and stability, despite only making up less than 1 percent of total foundation giving. Peace and security funders do a lot with a little: with only $351 million dedicated to peace and security issues (a fraction of the roughly $2.4 billion foundations provided in 2015 focused on human rights), these funders are contributing to big changes—from supporting the rights of women and girls in Syrian refugee camps to investing in research around offensive cyber capabilities. We’ve again captured some of these stories in the Spotlights found on this website and in the report, but these are just a small sampling of the contributions funders and their grantees are making in support of global peace and security. The field of peace and security funding is incredibly diverse, both in terms of areas of focus and types of funders. The hundreds of millions of dollars granted every year in this sector are helping to prevent and mitigate conflict and build stable, resilient societies across the globe. As illustrated by the sample grants in the website and report, the range of activities within this spectrum is wide—from promoting participatory governance in Burundi to more advocacy-based work, such as a campaign to reduce U.S. military spending. In addition to working on a variety of issues, funders in this field vary in type, regional focus, and average grant size. The quality of the Peace and Security Funding Index would be enhanced by more detailed grant descriptions. Ultimately, the quality of the Index directly depends on the quality of the grants data that we’re able to collect. Peace and security funders can help us improve the Index by providing timely, detailed information about a grant’s objective, intended beneficiaries, strategies used, and the areas to which funds are targeted. One-third of the grants we analyzed were included in one of the three “Other” categories, often due to a lack of specificity in the grant description. General support accounts for a modest, but growing, proportion of peace and security giving. 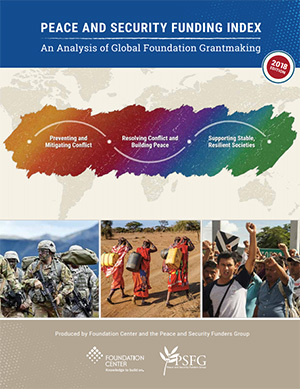 Peace and security funders provided 19 percent of their grant dollars through general support, up from 16 percent in 2015 and consistent with the proportion of general support provided by U.S. foundations overall. The proportion of funders making at least one general support grant for peace and security held steady at just over one-third (35 percent). Policy and advocacy, as well as research and evaluation, remain the leading strategies among peace and security funders. While funders support a full range of strategies, the majority of funding in the space employs policy work, and research and evaluation as a strategic approach. Peace and security funders are almost twice as likely as other grantmakers to fund policy and advocacy strategies, which suggests that funders believe policy levers are particularly important for effecting change in this space. Supporting research also remains a top priority. Sixteen percent of grant dollars awarded in 2015 funded research and evaluation, often to bridge the gap between the academic and policy worlds on topics such as cybersecurity, applying local knowledge in peacebuilding, and foreign relations.